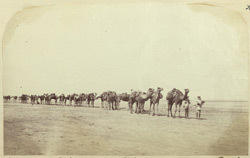 Photograph of a string of camels, transporting salt from Sambhar Lake in the jaipur district of Rajasthan, taken by an unknown photographer in the 1870s, part of the Dunlop Smith Collection: Sir Charles Aitchison Album of Views in India and Burma. Sambhar Lake has been the most important source of salt in this region for hundreds of years. In 1870, the British government took up the commercial production of salt after taking a lease from the rulers of Jodhpur and Jaipur. The Imperial Gazeteer of India states, 'The lake fills with the inflow of every monsoon, forming a sheet of water 60 to 70 square miles in area, and 2 to 4 feet in depth. The water enters with small quantities of salt in solution, but takes up larger quantities from the mass of silt forming the bed of the lake, where the salt brought by the rivers has been accumulating for an unknown length of time. Within two or three months after the close of the monsoon the lake-water is found to have absorbed sufficient salt to make a strong brine, and from this the salt is obtained by solar evaporation in specially constructed enclosures.' The extensive saline wetland is an important ecosystem, home to thousands of migratory birds and especially favoured by flamingoes.